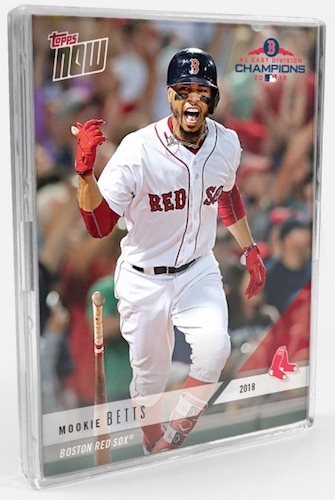 2018 Topps Now Postseason Baseball celebrates the MLB playoffs with team sets and limited autograph options for most of the squads. Sold exclusively on the Topps website, sales end on October 7 or as supplies last. Coming in at $49.99 per 15-card set, every playoff team is covered in the 2018 Topps Now Postseason Baseball checklist. There is also a special Autograph Edition set for most of the teams that offers the 15 base cards and one numbered autograph. Prices for these depend on the team and range from $69.99 to $134.99. All autographs are numbered and issued in the following versions: #/99, #/49, #/25, #/10, #/5 or 1/1. 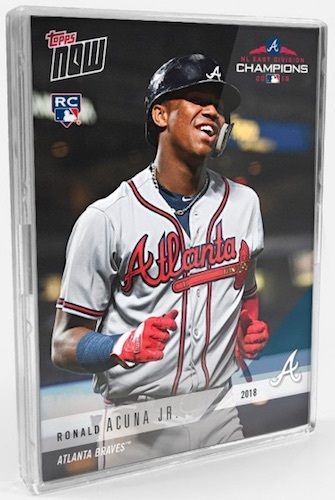 Shop for 2018 Topps Now Baseball cards on Topps. Collectors can be certain that they will receive all autographs for a given team by purchasing exactly the number of sets as there are autograph subjects. For instance, the New York Yankees have five signers, so purchasing five sets guarantees all five signers. Just as in many of the other Topps Now team sets, bonus cards are an incentive for ordering the sets. Not including the Wild Card games, every series win earns one bonus card with up to three available for the winning World Series team. These are mailed for free at a later date. 15 cards per main team set. Buy Now Postseason sets on Topps. Print runs (PR) and bonus cards added when known. AUTOGRAPH VERSIONS: #/99, #/49, #/25, #/10, #1/1. 15 base cards and 3 autograph subjects. Buy Now Postseason sets on Topps. 15 base cards and 6 autograph subjects. 15 base cards and 4 autograph subjects. 15 base cards and 5 autograph subjects.